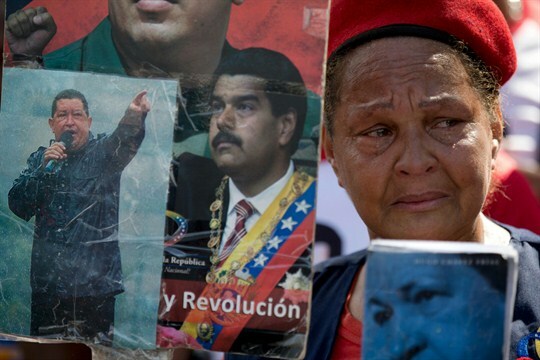 A supporter of the late Venezuelan President Hugo Chavez cries during a rally marking the fifth anniversary of his death, Caracas, Venezuela, March 15, 2018 (AP photo by Fernando Llano). It wasn’t very long ago that Latin American voters, in country after country, started electing leftist presidents. The new crop of leaders that rose to power over the past few decades occupied a wide range of positions along the ideological spectrum, advocating leftist policies that varied mightily—from mild income redistribution projects to aggressive nationalization programs. But what was unmistakable was the trend moving the continent decidedly leftward. Some dubbed it the “pink tide.” That tide is now receding with as much force as it came ashore. Last month’s surprise protests against the well-entrenched Nicaraguan government pushed the tide farther out.